Peugeot Mirror Screen® allows your compatible smartphone to communicate with any of the 208, 2008 SUV range, new 308 range (2017), 3008 SUV range, allowing you to display compatible apps on the 7″ touchscreen and manage them using the vehicle controls. Safe and convenient, Peugeot Mirror Screen® uses the latest MirrorLink® (for Android phones on 208) and Apple CarPlay® (for iPhones on 208, 2008 SUV, new 308, 3008 SUV) technology to bring smartphone connectivity to your car whilst keeping your eyes on the road and your hands on the wheel. Compatibility is based on the phone providers’ original operating system and therefore may change if the phone provider offers an update which renders the phone incompatible with MirrorLink®. “Mirror link”, properly known as MirrorLink® technology, was developed by the Car Connectivity Consortium, which brings together the leading manufacturers of automobiles, smartphones and consumer electronics as well as application developers. MirrorLink® is a standard link that connects smartphones to embedded infotainment vehicle systems. This allows the user to use some basic applications for smartphones in their vehicle. CarPlay® offers significantly improved functionality and ensures that Mirror Screen® on the 208, 2008 SUV, all-new 3008 SUV is compatible with current iPhones. 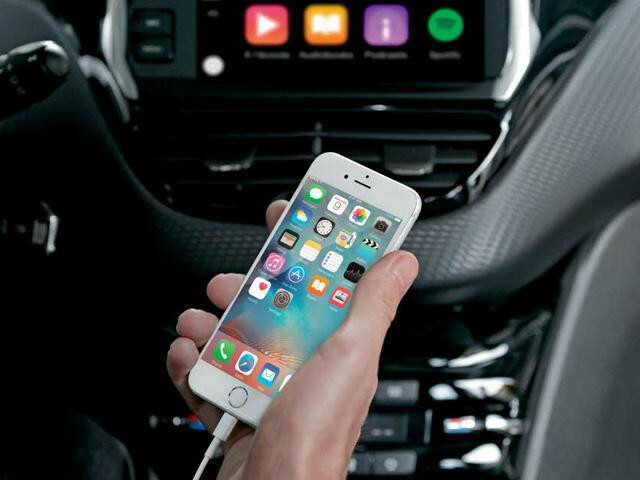 CarPlay® complements the PEUGEOT i-Cockpit® perfectly, as it features Siri voice control which allows phone calls, text messages, music and maps to be used without the need to take eyes off the road. No, the 7" touchscreen doesn't store any user data, it just receives and displays the features and content that is fed by the compatible smartphone. Connect with Bluetooth and with Mirror Screen®? Yes, our MirrorLink® enabled cars allow you to connect your smartphone with Bluetooth® and Mirror Screen®, to enjoy full use of the 208, 2008 SUV, 3008 SUV's technology. Alternatively, the 7" touchscreen can be connected to two smartphones at the same time, one with Bluetooth® and one with Mirror Screen®. What are the other features of the 7" touchscreen? In addition to Peugeot Mirror Screen®, the 7" touchscreen in the 208, 2008 SUV, 3008 SUV acts as the interface for the audio system, the trip computer and for vehicle settings. It also doubles as the reversing camera screen for added safety during manoeuvres (for model versions with a reversing camera). Touchscreen connectivity is also available via USB and Bluetooth®.